No less than six Grand Slam winners will head to Brisbane in order to take part in that city’s International 2017, sponsored by Suncorp. This is the richest pool of talent that this tennis tournament has ever seen: for the first time in history, five of the top ten women players in the world and five of the best male athletes have signed up in order to compete for first prize. Stan Warwinka from Switzerland; Rafael Nadal and Garbine Muguruza from Spain; Germany’s Angelique Kerber; Sveltana Kuznetsova from Russia; and Australia’s own Samantha Stosur, hailing from Queensland, are names making up the celebrity line up set to contend for the first position in the tournament next year. Women’s Tennis Association and world-ranked number five player Dominka Cibulkova, from Slovakia; United States Open finalist and world-ranked number six Karolina Pliskova from Czechoslovakia; and Russia’s world-ranked number nine player Svetlana Kuznetsova will be joining world number one Angelique Kerber from Germany; and French Open winner Garbine Muguruza from Spain in the women’s playing field. In the men’s arena, Spanish star Rafael Nadal will contend with defending champion and world ranked number three player Milos Raonic from Canada; United States Open winner Stan Wawrinka from Switzerland; Japan’s Kei Nishikori; Austria’s Dominic Thiem and Australians John Millman and Bernard Tomic. Canadian megastar Eugenie Bouchard will make her first appearance in Brisbane as well, as will Spanish celebrity player David Ferrer. 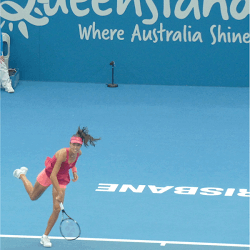 Geoff Quinlan, Director for the Brisbane International Tournament of 2017, has said that the opportunity to see some of the best tennis players in the world today in terms of both male and female athletes is “beyond exciting” for fans. He has stated that tennis enthusiasts will be able to enjoy an exhilarating week of entertainment thanks to the fact that Brisbane International Tournament’s “best field yet” has signed on for next year’s competition. Quinlan went on to say that the Tournament is seeing many of the top tennis players in the world returning every year, and that this is a testament to how much these players love the event, and the fans who show up to support them every time. This, when added to the pool of talent set to debut in Brisbane next year, is helping to ensure that tennis fans are in for “something special”.